Drives Subjected to High Loads There are 3 products. 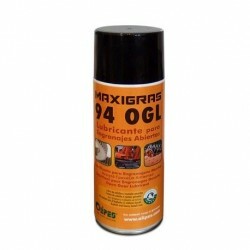 Maxigras 94 OGL/F is an EP complex aluminium grease with very high viscosity (ISO 2000 base oil) and very fluid consistency. High purity colloidal graphite content. Maxigras 94 OGL/2500 is an EP complex aluminium grease with very high viscosity (ISO 2500 base oil) and very fluid consistency. High purity colloidal graphite content.